Professional development can improve teaching effectiveness, empower growth, and keep teachers satisfied. Research shows that this has a positive impact on student success. In fact, teachers account for 30% of the variance in student achievement*, so it’s no doubt that their role is crucial. 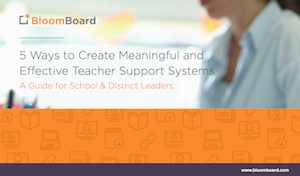 Download the eBook and provide better teacher support today! *Teachers Make a Difference, Hattie, 2003.